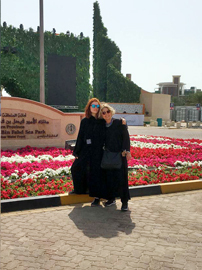 With so many things to do at the just-completed reunion in Dhahran, it would have helped if I had been able to clone myself in order to take everything in. Trying to decide which options to choose was perhaps the most difficult task I faced all week. In truth, though, all of the options offered were great. With early morning, pre-dawn starting times, however, some activities were more challenging to participants like me than others. Fortunately, all were rewarding regardless of starting times—that according to everyone I spoke with, anyway. 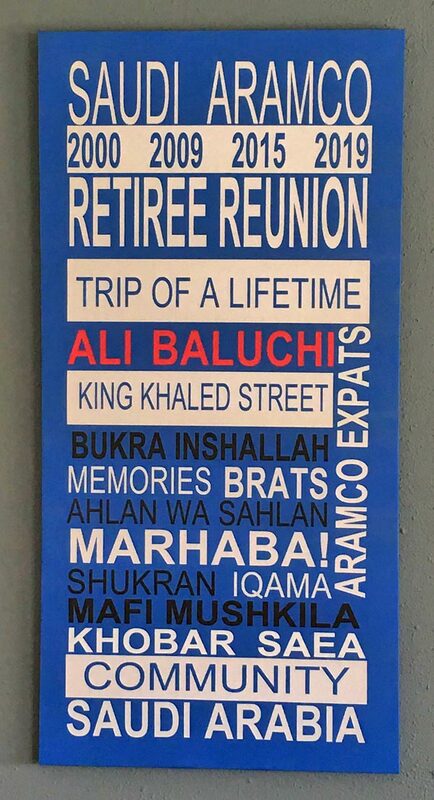 The funny thing is, I’ve felt this same way about every Saudi reunion I’ve ever attended. The programs are always so rich and varied, it’s amazing how the organizers manage to pull it off, but somehow, by magic and lots of hard work, they do. “You can take that to the bank!” to quote an old expression my father was fond of using. 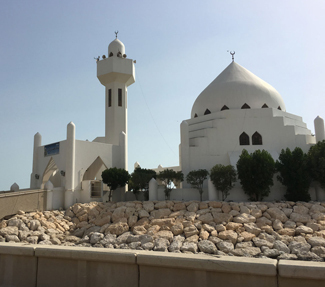 For my Friday morning (March 15) activity, I chose to take part in a photo trip to Dammam and Al-Khobar. With eyes barely half open I joined an eager-if-somewhat-drowsy throng and together we set off from camp at 4:40 a.m. intent on catching the first light of day. 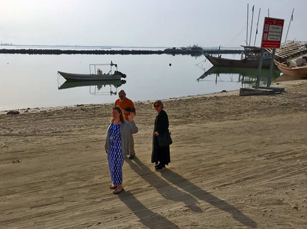 Joy Alexander Neumann, former Aramco Brat and current resident of Dhahran with her husband and three children, led the tour. Her command of Arabic was impressive, far better than anything I managed to master during my 25 years in the Kingdom. Our sleepiness was soon replaced by pure joy (pun intended) thanks to Joy. 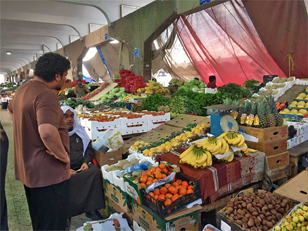 One of the stops she arranged was at the vegetable suq, a large, sprawling space where auctions are held weekly. 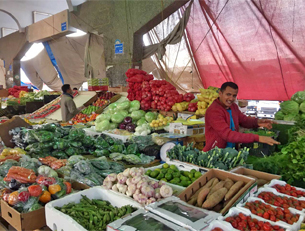 Traders come from all around to buy in bulk and resell their hauls of veggies in turn to local merchants as part of a time-honored ritual. 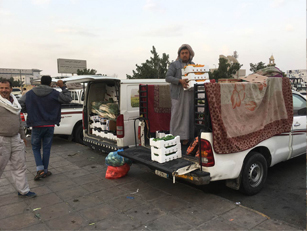 I can’t tell you how many times I bought vegetables and fruit from similar vegetable suqs in Abqaiq and Ras Tanura! I’m sure that many of you readers can say the same. 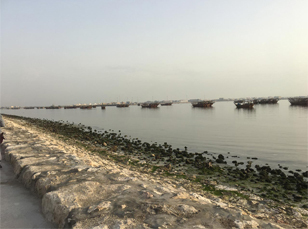 I was especially struck by the sight of the colorful array of dhows, lighters, and pearl boats moored along the Corniche between Dammam and Qatif. Many years ago I took a chartered dhow on a dive trip to the Karan Islands. 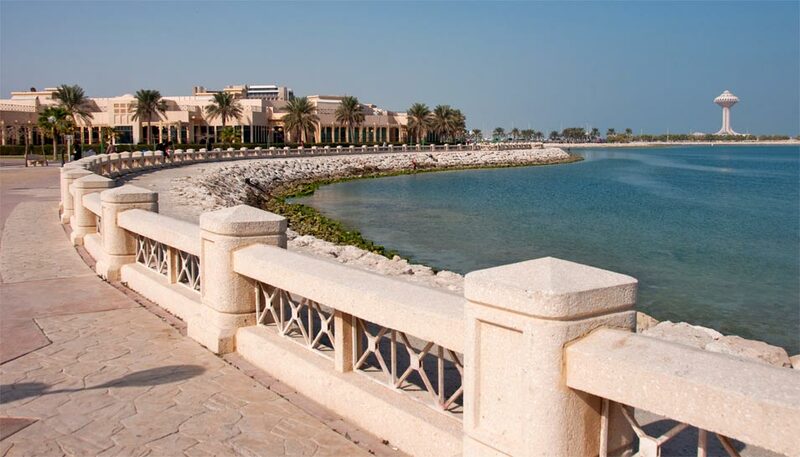 My visit to the Corniche brought back a flood of pleasant memories, and that was just one of many. 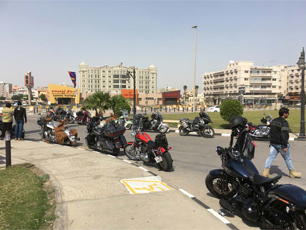 A procession of Harleys and other makes of motorcycles roared past us while we were admiring the dhows. 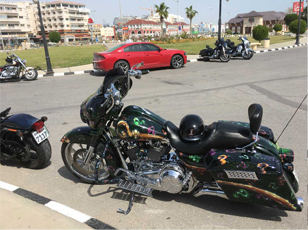 We spotted them again about an hour later parked outside a Starbucks on the Corniche in Al-Khobar. There must have been 50 of them at least. They came from Saudi Arabia, Bahrain, and other countries in the region and were attending some sort of jamboree. Judging by their loud laughter and bright smiles, the riders were having a merry time. 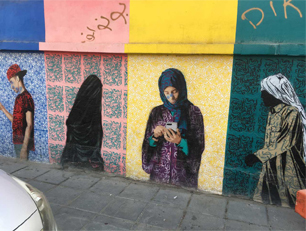 Later I was struck by a colorful display of murals painted by local artists—both men and women—festooning the walls of a cluster of buildings in a small area located between Al-Khobar and Thuqbah. 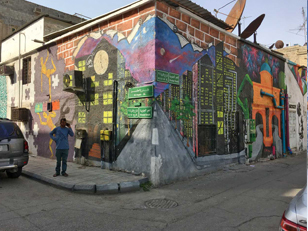 The images were vibrant and alive, a wonderful testament to the imaginations of their creators. 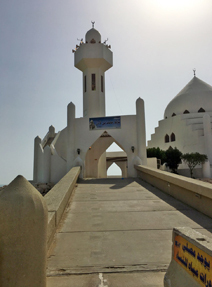 There were more mosques fronting the Corniche than I remembered from past visits. 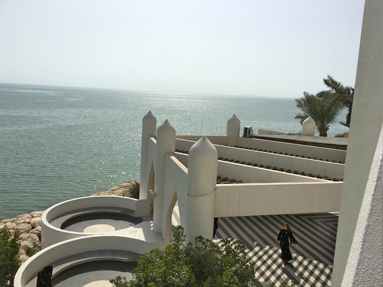 They were of different architecture, many of them overlooking the Arabian Gulf. 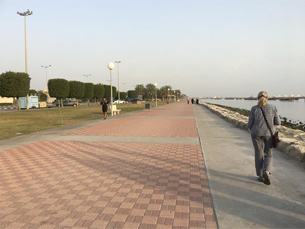 I fell in love again with the way signs on the Corniche in Al-Khobar are in both Arabic and English. 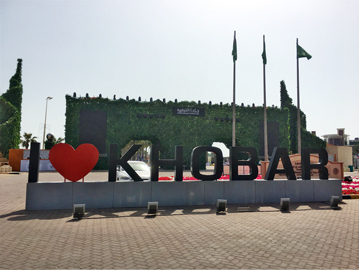 We stopped at the “I Love Al-Khobar” sign. Of course, everyone snapped photos. After all, we’re Aramcons. Acceding to our requests, our bus driver agreed to take photos of all of us using the plethora of cameras and smartphones we handed him. It was comical in a good-natured sort of way to watch him fiddle with the cameras and phones, trying to figure out which button to push and how to adjust the focus. There were smiles and laughter and jokes aplenty. 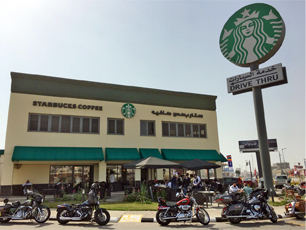 The Corniche in Al-Khobar was lined with an assortment of familiar fast food/chain restaurants: Chilis, Pizza Hut, Fridays, and Starbucks to name but four. I stopped at the Starbucks and bought an insulated coffee mug decorated with Saudi images and Arabic lettering as a special gift for a friend back in Seattle whose company manufactures similar items for Starbucks stores the world over. I’m guessing he doesn’t have this particular one in his personal collection, but he soon will. But then, I wouldn’t be surprised if his company made the mug I just bought. Oh, well. 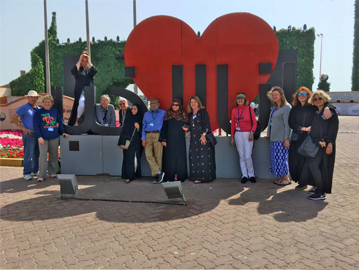 You needed a yardstick to measure the width of my smile when I noticed that an artfully-designed sign hanging in the Reunion Hall included the name Aramco ExPats. Free advertising thousands of miles away from home. Thank you very much to whoever arranged that! I have one recommendation for readers who are debating with themselves whether or not to attend future reunions in the Kingdom. To quote those omnipresent Nike ads, just do it. You won’t regret it. If your budget and calendar and health will allow, just do it. You’ll be glad you did. Plans are already underway for the next such gathering. I hope to see you there. 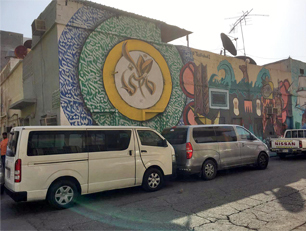 Look for notices regarding the next reunion on the pages of this newsletter and on the AXP website, your trusted sources for news on everything that’s happening in the Aramco ExPat community worldwide.